I believe winter squash should be stored in "warm" (I.e. not chilly or freezing) dry space. So basement is not suited (and not the pit either). Have you ever read the Little House books? Pumpkins were stored in the attic where Laura and Mary used to play. The "PIT", is just that. Dig a pit and put your taters and carrots in it and cover it up with soil. OK to put some leaves over it too to help keep the cold out. The temperature of the ground a foot underground remains pretty constant all winter. The moisture in the soil keeps the produce from dehydrating. Potatoes and carrots will keep till spring in a pit. You can dig some up anytime you want if weather permits. I have kept cabbage in a pit too. I like to wrap it in paper then put it in the pit. If you have a piece of canvas or carpet that you can put over the veggies before throwing the dirt on, it makes it a bit easier to get some from the pit when you dig it up. Any root crops keep well in a pit. When I lived in Tennessee I often though of doing something like the pit. One year I dug a hole and lined it with bricks like they do a hand dug well it stayed full of water all winter. With 300 days of rain every year in TN the garden was often covered with 2" of water for 6 months. During cold 15 degree weather the water and soil would freeze 8" deep. Not much snow in TN but plenty of cold and rain. I never tried the pit I did not want to risk loosing my crop in all that water. I can see how the pit will work fine in a geographical location with less rain and well drained soil. My cousin that lives in Illinois dug a hole for an old junk not working refrigerator to lay on its back. His pit is a refrigerator laying on its back. All you can see is the refrigerator door sticking up above the ground. Open the door and there are all the vegetables. I am not sure how well his refrigerator works but I can see doing the same thing with a wooden box with no bottom and a well insulated door. My grandparents used to have their pit in the barn. My Dad used to have to go out every day and dig up what ever potatoes grandma wanted for that day, They used to put layers of straw between the potatoes. I made some fresh French fried taters for lunch today nothing better than fresh fries. I wish I had a root cellar! I am surprised at myself for not doing this sooner....... or maybe a root cellar? 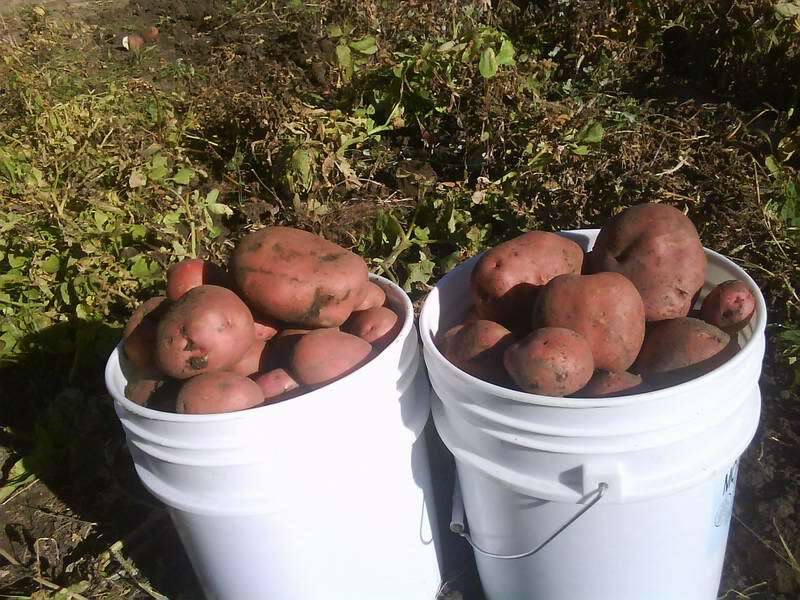 Problem is, I can't see spending too much to preserve a couple sacks of taters. The fancy agricultural term for this is a "clamp". Pit seems more descriptive, but there you have it. You can also build a mound if you have high ground water. If you live in a mild winter climate, this is also known as a Habitrail. The fancy agricultural term for this is a "clamp". I am sorry, but the term "Clamp", near as I have been able to tell describes a pile of potatoes on top of the ground and covered with straw and plastic. Unfortunately such a set up will not keep the potatoes from freezing in climates like I have here. The winters are cold with temps down to minus twenty or lower some years and I have seen it be below zero for three weeks at a time. The frost penetrates when this happens. Water lines are put over 3 feet below grade in this country to prevent freezing. The potatoes in my pit will be 14 inches below grade and then I will add some insulation over that , leaves or straw. If we get snow, as we usually do before zero Temps, then that also adds insulation. I have never had my potatoes freeze in this kind of pit, in spite of our nasty weather. Gotcha. No mounding - you just backfill and call it good? I wish I could do that. Too much ground water here. Ya, if you have ground water you can't do this. I am fortunate in that I have 26 inches of silt/clay then under that is gravel. No water in the gravel layer so any surface moisture is free to go on down, not fill up the pit. what to do 1st digging or watering ?